B@lls maybe for the men but there are many women racing as well, not sure what gets them down the 12km from the Valluga but something quite special. 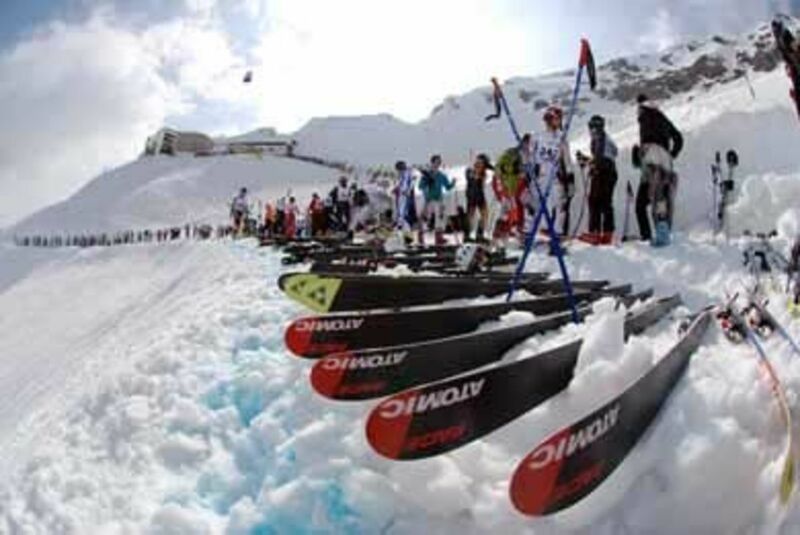 The ‘White Rush’ or ‘Der Weiße Rausch’ is one of the elite ski races, these people are made of iron. A mass start provides snow littered with skis and bodies, soon followed by an uphill sprint to get the cardio working. What follows is ungroomed / moguls in spring snow down to St Anton – a total of 12km. Ski selections tend to be long meaning route-one action. Snowboarders have the advantage in the uphill climb section with their lighter / easier to handle boards and better footwear but it is the 2m+ skis of the serious players that see the skiers streak ahead of the field. With over 500 racers there were 3 starts and the first saw over 200 drop off the Valluga starting point. When they do reach the safety of St Anton resort there is an elevated platform of snow blocks to runs through for the finish line – gruelling to say the least. I was there to film the action but David, a local from St Anton carried our helmet camera. We will add the video as soon as we have cut it. St Anton will currently be rocking hard – this is the season ending weekend and for me one of the ultimate races on the ski calendar. I left a very large après ski party behind in St Anton en-route back to Innsbruck!